This chapter describes the use of mobile technologies as research tools while discussing both the benefits and limitations of this mode. It maps practical approaches to the management of a mobile, digital data collection process and its accompanying challenges, namely the potential and pitfalls in gathering, coding and archiving the research data. The use of mobile technology devices and the amalgamation of hardware, operating systems, networking and software to facilitate and support this process are discussed. The lessons learned from the technical aspects underpinning fieldwork for research purposes will assist others in maximizing the potential of mobile technology to support their research projects. 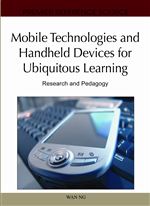 This chapter discusses the arrival of mobile technologies, types of digital research methods and issues in exploiting the capabilities of the technology. Practical suggestions for technical strategies and processes are made so that qualitative researchers may employ those for and in their research contexts. It is argued that mobile technologies need to be adopted and that their integration will require a rethinking and reshaping of social research and its practice. New developments in Information and Communication Technology (ICT) and their pervasiveness in contemporary culture constantly change the way people communicate and interact. This widespread availability and accessibility of ICT has implications for investigating and understanding a technology-saturated society. Without a doubt, mobile technologies transform the way we do things including the way we do research. Mobile technologies provide an eclectic assortment of sources (text, audio, still images and film clips, which enable new ways of creating, collecting, processing and analyzing material. Although this diverse combination adds richness to the research materials, it also highlights the need to integrate and blend the mixture properly. In consequence, in dealing with digital forms of data, researchers will need different skills, expertise, resources and tools. Given that they are the growth platform of the future, it is imperative for evolving research practice to incorporate these new techniques into the existing research repertoire. Furthermore, the implications of multimedia for qualitative research in general and the impact of digital technologies on social research in particular will not only transform the way in which research is done but also the way in which research narratives are constructed. Prior to tackling the methodological, theoretical, technical and ethical aspects of dealing with digital technology as research tools, it seems appropriate to briefly clarify the terminology. New technologies, emerging technologies, digital technologies, mobile technology and portable technology are terms that are often used interchangeably to describe advanced technologies in recording and manipulating information and communication. In this chapter, Information and Communication Technology (ICT) will be used as an umbrella term to refer to the use of computer-based information systems (i.e. PCs, servers, mainframes, networked storage) to convert, store, protect, process, transmit and retrieve information. Digital technology has the same functionalities but the associated devices (i.e. tape recorder, still cameras, camcorder) are not computer-bound. Their main advantage is the freedom of mobility, hence mobile technology is exactly that: technology that is portable. Thus, they are ideally suited for conducting fieldwork, yielding audio-recordings, photographs, video footage, graphics and so on. These digitally-generated research materials can be integrated through the computer - together with traditional written interpretation – into hypermedia environments. Hypermedia meshes audio, video, text, graphics and hyperlinks to create an interactive, non-linear stream of information (for example the world wide web).